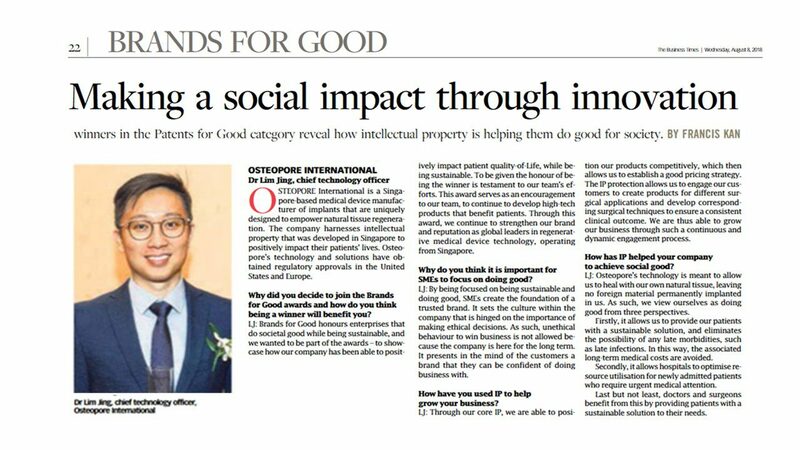 SMEs that are leading the way in social responsibility are in the spotlight for Brands for Good 2018, an initiative launched this year to recognise the achievements of local companies that champion corporate social responsibility. Congratulations, Osteopore! This award epitomises your mission to harness technology in Tissue Engineering, Regenerative Medicine and 3D printing to help patients to heal and regain confidence in their daily living. OSTEOPORE International is a Singapore-based medical device manufacturer of implants that are uniquely designed to empower natural tissue regeneration. The company harnesses intellectual property that was developed in Singapore to positively impact their patients’ lives. Osteopore’s technology and solutions have obtained regulatory approvals in the United States and Europe.